Nice to meet you for the first time! I'm Sugiyama Ryuu. This time I was allowed to debut in MF Bunko. Please take care of me. Since I'm an only child, I've always been longing have brothers or sisters. If I only had a cute little sister of a reliable older brother... and such delusions have given birth to this story. The protagonist——Yoichi-kun was suddenly given five little sisters, and from the beginning till end he was confused about what to do. He was pulled around between various unique little sisters, and wasn't able to call himself a reliable brother yet. Sure enough, the ones who hold the key deciding whether Yoichi-kun can become a splendid big brother are the five little sister candidates. The first one to be seen is the stay-at-home downer girl Selene-chan. She can't clean up and is a shut-in who loves to laze around in home! If I write only this much, it'll seem like she's the worst kind of human being, but in fact she has a great talent for making clothes. In order to measure size for the clothes she throws her arms around other little sister candidates. Truly an outrageous girl. The second one is the gamer girl Tomomi-chan who loves competitions. She's a little sister but also she's a high school freshman just like Yoichi-kun. It's a mysterious setting to have a little sister in the same grade. She wants to compete with Yoichi kun but also she also honestly reveals "I want to be spoiled by Onii-chan!" type of feelings. "Take care of me! Play with me! Look over here! ", a puppy-like girl. The third one is honour student manual girl Sayuri-chan. An orthodox little sister character who will cook for her Onii-chan... is what I thought, but when there's no manual to follow the honour student mask comes off and she's incredibly anxious. Her weakness is the word 'fate' and tends to surrender often. After meeting with Yoichi-kun her mask fell off and was supposed to find 'quality of being herself'... but it seems like the situation became even more complicated. The fourth one is a very refreshing boyish girl Yuuki-chan. Even though she's a little sister she cross-dresses. In fact because of one boy back in elementary school she started polishing her already cool appearance and atmosphere, which led her to become very popular among girls. Before I become a little sister I want to become a full-fledged girl! And in order to fulfil that wish of Yuuki-chan's, Yoichi-kun contributes to her girl power increase. The fifth is an orthodox little girl Mika-chan. She's in sixth grade of elementary school but she both looks and acts younger than her actual age and her classmates. 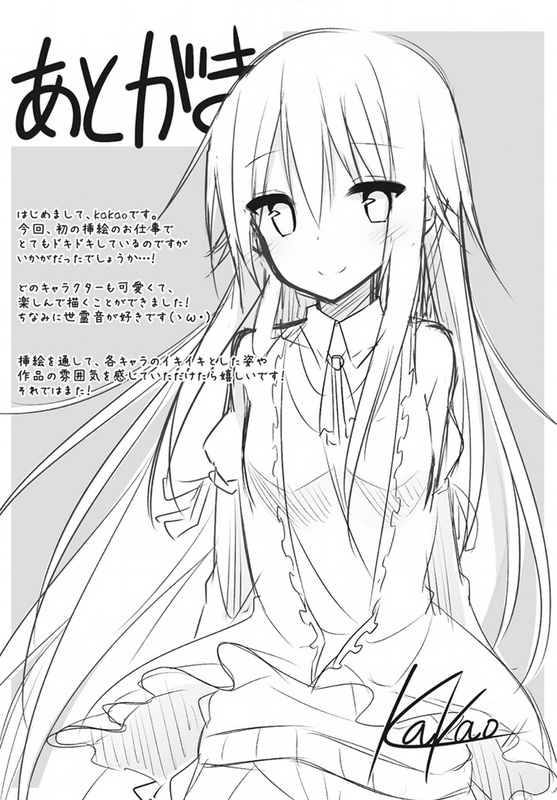 A girl who wants to hurry up and become an adult lady to help Onii-chan and her sisters... however, seeing her current cuteness and loveliness you want to watch over her more and more, her older brother's heart was filled unexpectedly with parental love. She could be called an existence that's on a cheat-level when it comes to cuteness. And the protagonist spends two weeks with such unique five individuals, the five problem children little sister candidates. I would be very happy if you have enjoyed it. 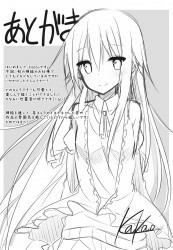 And last, for those who patiently interacted with me as this book was written, S-sama in charge of me. The one who drew charming little sisters kakao-sama. And you all who have accompanied me me until this last line of text. Thank you.